CAPE CANAVERAL, Fla. -- Imagine a planet with triple sunrises and sunsets every day for part of the year, and nonstop daylight at other times. Astronomers revealed such a place Thursday: a strange new world in the Constellation Centaurus that has not one, not two, but three suns. What's more, a year there lasts half a millennium from Earth's perspective. Discoverer and lead author Kevin Wagner said he's thrilled "to have seen such a beautiful part of nature that nobody else has seen." 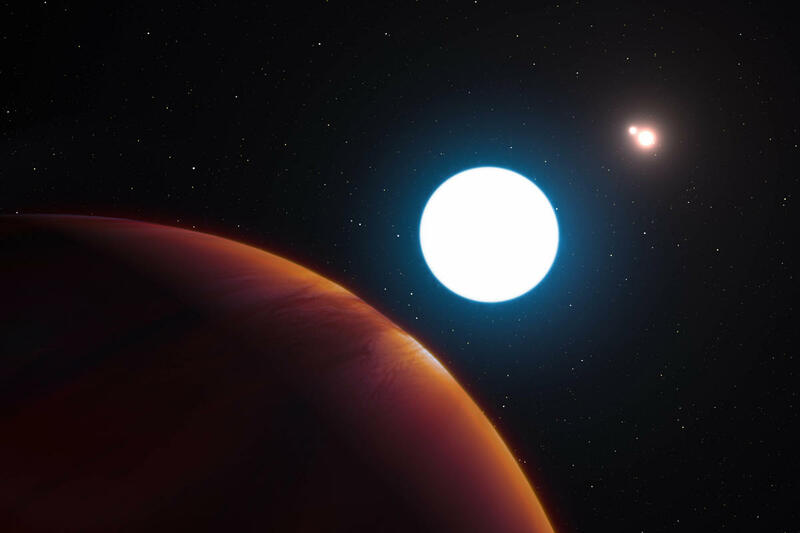 Triple-star systems with detected planets are rare enough; this is believed to be just the fifth such discovery. But the giant gassy world in this one - formally known as Planet HD 131399Ab - has the biggest known orbit in a multi-star system. Its orbit is double Pluto's - or roughly 550 Earth years. That's how long it takes to orbit its system's brightest star, a super-size sun. The two smaller stars orbit one another and, as a pair, orbit with their big stellar brother. Planet HD 131399Ab has four times the mass of our own Jupiter. With such a wide orbit and companion stars, scientists would expect a planet like this to be kicked out in a tug of stellar war. Yet that's not the case. During part of the planet's orbit, all three stars are visible on the same day, offering triple sunrises and sunsets and allowing for day and night. For about one-fourth of its year - around 100 to 140 Earth years - there's continuous daylight. That's because as the big sun is rising, the two smaller ones are setting. The astronomers used the European Southern Observatory's Very Large Telescope in Chile to spot the planet 320 light-years away. It is one of the few exoplanets - planets outside our own solar system - to be directly imaged. Most exoplanets are identified by periodic dips in starlight as the planets pass between us and their stars. As for the planet's alphabet-soup label, "I wish we had a better name," Wagner noted. There is an official protocol for naming planets and their surface features. The International Astronomical Union, in fact, has a relatively new group to handle public naming campaigns.